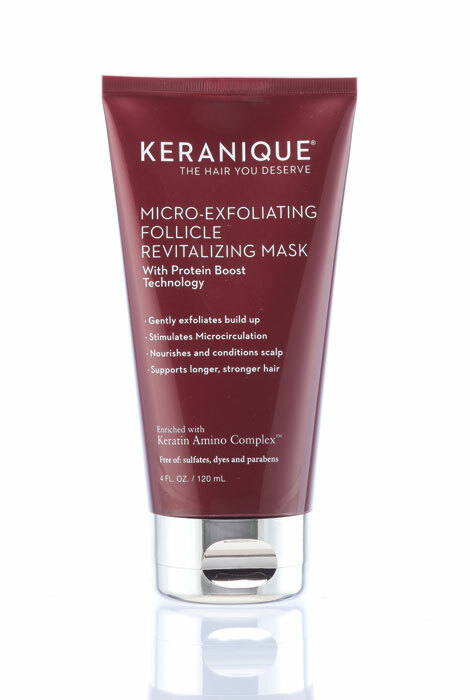 The skin on your scalp needs exfoliation just like facial skin, and the Keranique® Micro-Exfoliating Follicle Revitalizing Mask is the perfect choice. This hair mask removes dead skin from the scalp while helping to thicken hair shafts and repair split ends. The breakthrough, multifunctional exfoliator removes sebum and scalp buildup, allowing penetration to the root and follicle. It addresses hair thinning and loss, gently conditions the hair and scalp, and improves the elasticity of the hair fiber to protect against future breakage and loss. Infused with Keratin Amino Complex™, it helps to strengthen, stabilize and normalize hair, nurturing the scalp to promote healthy follicles. The exfoliating mask can also be used as a weekly deep conditioner. The result is a healthy scalp and vibrant, volumized hair you’ll be proud to show off. Can use as a deep treatment before shampoo. Damp/mist hair with water and apply to scalp with gentle massage. Put a shower cap on and let sit for 10 minutes, and then rinse out. Follow with Keranique Scalp Stimulating Shampoo, Deep Hydration and Keranique Volumizing Keratin Conditioner, Deep Hydration.Alternatively, for quick scalp exfoliation, squeeze excess moisture from the hair after shampooing and rinsing hair as normal. Massage the product gently into the scalp for two to three minutes while still in the shower and then rinse with cool water. For best results use 1 - 2 times a week as needed. I’m 62 and I think my hair needs something new to try. Want to see if this products helps to eventually thicken my hair.